3.5mm Bullet Plugs (2 pair) Short plug set. ..
Lower resistance means more power and longer runtimes. Reedy's new easy-to-install high-performance ..
4.0 mm Super Bullet Connectors, 4 Female pcs ..
4.0 mm Super Bullet Connectors, 4 Male pcs. ..
4.0mm Gold Plated Inline Connector (4 Female). ..
4.0mm Super Bullets Solid Gold Connectors, 2m/2f. ..
4mm Bullet Male Connector, 1pr. 4mm Bullet Male Connector, 1pr. Gold Plated. ..
4mm Bullet Plugs (2 pair) ..
Have dual battery post sizes? Here is your solution. Trinity's dual charge post. Has 4mm on one end ..
Connects Traxxas ID Batteries To Chargers W/Separate Balance Ports. 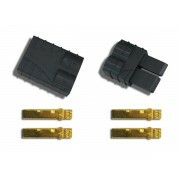 ..
Align Multicopter 4mm Gold Connector Set, 2pr. ..
Associated 4mm Female Bullet Connectors, 10pcs .. This adapter allows a battery equipped with an EC3 connector to be used with a Traxxas ESC. ..
Racers Edge Battery/ESC Adapter: EC3 Battery to Male Deans (T-Plug) ..
Castle Creations 5.5mm Bullet Connectors M/F 3pr. ..
Castle Creations High Current 5.5mm Bullet Connector, 3pr. Castle Creations High Current 5.5mm Bullet Connector, 3pr. 13ga To 10ga wires, Up To 150A Current. ..